The show airs daily at 7:00 a.m. and 7:00 p.m. on Suddenlink’s channel 17. This month’s show will air May 28, 2018 – June 4, 2018 and features the Vining Library Auction. 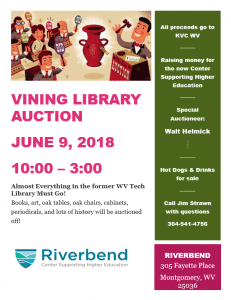 We interviewed Rusty Webb, Strategic Team Member with KVC-WV, about the upcoming auction event in the Vining Library on the campus of Riverbend in Montgomery, WV. Riverbend is the new school that was formerly WV Tech. KVC-WV purchased it last year. Rusty talked about the need for Riverbend. Every year, nearly 30,000 young adults “age out” of foster care without the life skills and support network to help them become independent, successful adults. These youth want to go to college (84%), yet 51% don’t complete high school. Just 2% of youth emerging from foster care earn a degree of any kind after high school. To address this national crisis, KVC Health Systems, a private, nonprofit child welfare and behavioral health organization, is establishing the nation’s first college campus designed specifically to support youth transitioning from foster care. Riverbend Center Supporting Higher Education aims to be a new national model, representing a unique infrastructure of specialized services and supports, tailored to seamlessly support older youth from foster care into high-demand careers paying sustainable wages. To help raise money for KVC, they are having an auction in the Vining Library on June 3, 2018 from 10-3:00. The library is located at 305 Fayette Place in Montgomery. Books, oak tables, oak chairs, art, furniture and other ‘library’ items will be auctioned off or sold. The event is FREE to the public. Concessions will be available. Call 304-541-4756 with any questions.